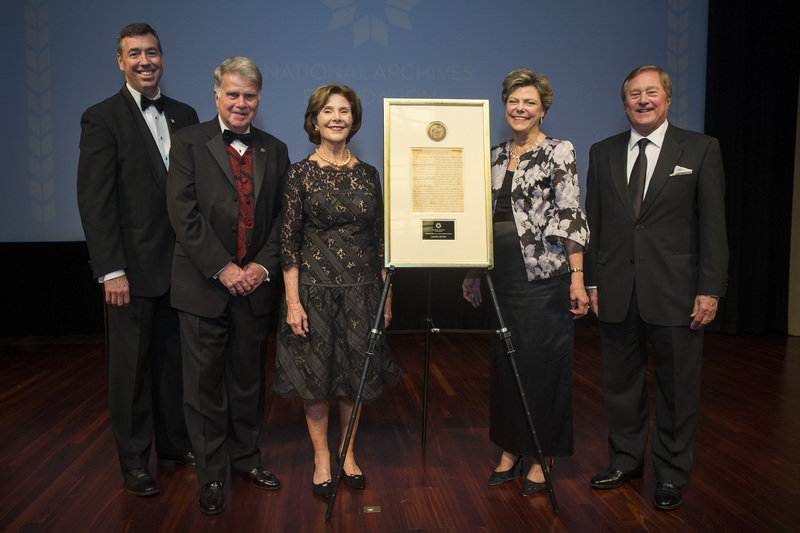 On Wednesday, October 10, the National Archives Foundation honored former First Lady Laura Bush as the 2018 recipient of its Records of Achievement Award in recognition of her dedication and commitment to building a literate and civically engaged global community. Through her outreach work, First Lady Laura Bush has educated, enriched, and inspired generations to a deeper appreciation of our country along with its ideals and aspirations. In addition to her work at the Bush Center, over the decades her visionary programs, such as Middle School Matters, the School Leadership Initiative, Advancing Accountability in Education, and the National Book Festival, have had a deep impact to citizens of all ages. The Records of Achievement Award is an annual tribute given by the National Archives Foundation to individuals whose work has cultivated a broader national awareness of the history and identity of the United States through the use of original records. Through their work, recipients educate, enrich, and inspire a deeper appreciation of our country, its ideals and its aspirations. Previous recipients of the Foundation’s awards include: Tom Hanks, Ron Chernow, Thomas Kail, Lin-Manuel Miranda, Taylor Branch, Robert Edsel, Steven Spielberg, David M. Rubenstein, Ken Burns, Annette Gordon-Reed, and more. Click here to see photos from this year’s event! 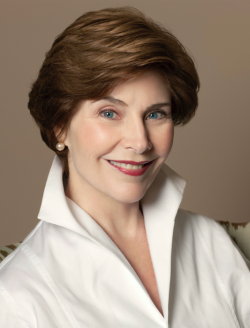 Laura Bush, former First Lady of the United States, is an advocate for literacy, education, and women’s rights. As First Lady, Mrs. Bush advocated the importance of literacy and education to advance opportunity for America’s young people and to foster healthy families and communities. She highlighted the importance of preparing children to become lifelong learners, convening a White House Summit in 2001 on Early Childhood Cognitive Development. Since 2003, she has served as the Honorary Ambassador for the United Nations Literacy Decade. Laura Bush visited schools and met with students in nations from Afghanistan to Zambia, with a particular focus on the education of girls and women. Mrs. Bush worked with the Library of Congress to create the National Book Festival in Washington, D.C. in 2001. The National Book Festival continues to this day and annually attracts more than 120,000 Americans. The Texas Book Festival in Austin was founded in 1996 by Mrs. Bush while she was First Lady of Texas. At the Bush Institute in Dallas, President and Mrs. Bush’s Education Reform initiative works to improve student achievement through effective school leadership, middle school transformation, and the use of accountability. Mrs. Bush is the author of the bestselling memoir, Spoken From the Heart, and bestselling children’s book, Our Great Big Backyard. She serves on many boards, including the National Advisory Board for the Salvation Army, the Council for the Smithsonian National Museum of African American History and Culture, and the Board of Trustees for the National Trust for Historic Preservation. Laura Bush was born in Midland, Texas, to Harold and Jenna Welch. She holds a Bachelor of Science degree in education from Southern Methodist University and a master’s degree in library science from the University of Texas. She taught in public schools in Dallas, Houston and Austin and worked as a public school librarian. She served as First Lady of Texas from 1995 to 2000. The 2018 Records of Achievement Award Ceremony and Gala is made possible in part by AT&T, Governor Jim and Janet Blanchard, and Edgeworth Economics.